RACE for the Orphans is excited to award three deserving families grants this year through the RACE Grant Program. More than 700 runners and walkers participated in the 5th Annual RACE for the Orphans 5K, and $33,000 was raised to help these families bring their children HOME! have enjoyed seeking God together and watching His mighty hand work and guide them- as well as provide for them! They cling to the verse: 1 John 4:19 “ We love because He first loved us.” They are not rescuers but they rescue because God has rescued them. God has made it abundantly clear that they are the parents to a one-year-old little girl in China. She was born with spina bifida and a tethered spinal cord. The Parkers believe that her life will be defined by her character and not by her special needs. They eagerly await meeting their daughter and adding the littlest Parker to their family. Anthony, Brittany, Livi, Ethan and Jett live in Villa Rica where they attend Westhills Church and Classical Conversations co-op. Anthony enjoys going to work every day at McMaster-Carr Industrial Supply. Brittany tutors with Classical Conversations and teaches their children at home. Trey and Crystal were married in October of 2013. 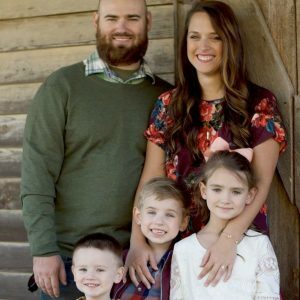 Trey works as the Student Pastor at First Baptist Church of Newnan, and Crystal stays at home and assists Trey when needed. When Trey and Crystal were dating he went to the doctor and was advised to not ever have children biologically due to a condition he had when he was born (tuberous sclerosis). This news was devastating to Trey, but Crystal assured him she had always wanted to adopt anyways! Crystal grew up having a best friend who was adopted and that friend obviously had a huge influence on her life. 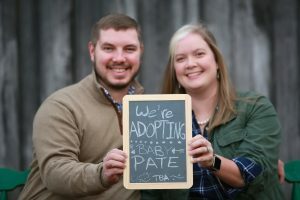 The Pate’s truly believe God has called them to adopt and love this crazy journey He has for them! Adoption to Trey and Crystal is a beautiful picture of Christ’s love for them. This past October they were so excited to celebrate their 3-year wedding anniversary, but they were even more excited because that meant they could officially apply for adoption! In November of 2016 they submitted their application and were accepted into the domestic adoption program of Lifeline Children’s Services. It has truly been a whirlwind and faith-stretching journey, and they continually pray for the child God is going to place in their lives. Sasha and Ashley will celebrate ten years of marriage this May but they have been friends for 21 years. Both of their families have been blessed through adoption, so they always knew they wanted to adopt. They have three biological children, Tristan (10), Sylas (8) and Esther (4). 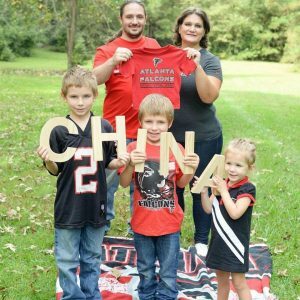 After several miscarriages and lots of prayer, Sasha and Ashley felt God leading them to adopt from China. 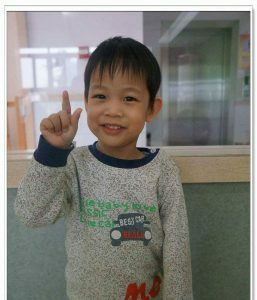 In July of 2015, they fell in love with the picture of a little boy in China who needed a forever family. They called him “Robbie” (after Ashley’s late father, Robert) and started praying for Robbie to become their son. God answered their prayers and Sasha and Ashley recently returned from China to adopt their 3 1/2 year old son! Sasha and Ashley have felt the Lord through this entire process, and they say it has strengthened their faith, marriage and family. Sasha, Ashley, Tristan, Sylas, and Esther live in Fairburn and are active members at Newnan Church of Christ. Sasha works at Securitas Security Services and Ashley took a job at Dunkin Donuts to help pay for adoption expenses but hopes to stay home once they return from China. Sasha and Ashley are excited to have Robbie as part of their family…forever!